+++SOLD+++ ONLY 8200 MILES! 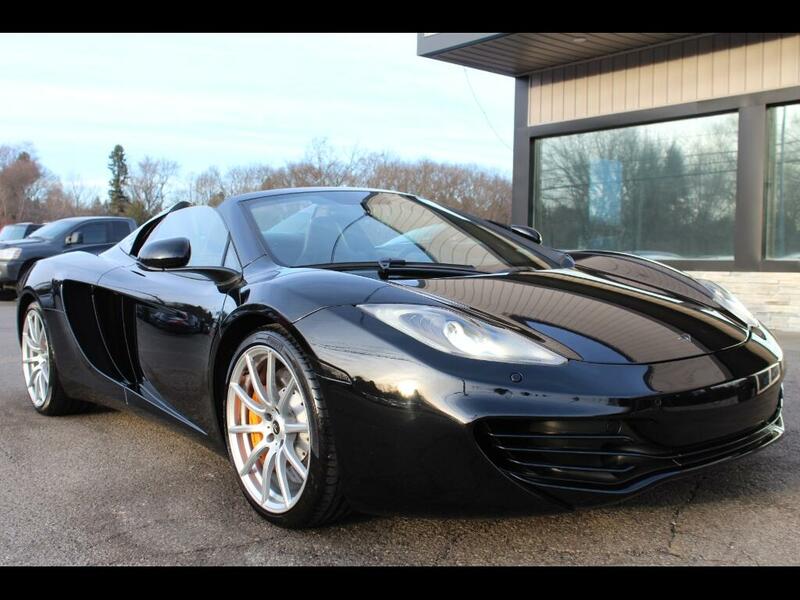 2014 MCLAREN MP4-12C SPIDER CONVERTIBLE FOR SALE. 3.8L V8 TWIN TURBO! SEVEN-SPEED DUAL CLUTCH GEAR BOX WITH PADDLE SHIFTERS AND AUTOMATIC MODE! THIS BEAST HAS 616 HORSEPOWER, 443 LB-FT OF TORQUE AND WILL GO 0-60 IN JUST 2.9 SECONDS WITH A TOP SPEED OF 205 MPH. ESTIMATED TOTAL MSRP ON THIS CAR NEW WAS $304,710. SOME OPTIONS INCLUDE: SPECIAL PAINT($2400), SPORT EXHAUST($6330), STEALTH PACKAGE BLACK EXHAUST($1080), CARBON FIBRE INTERIOR UPGRADE($4200), IRIS SATELLITE NAVIGATION W/MERIDIAN AUDIO($7200), FRONT AND REAR PARKING SENSORS($2160), CARBON FIBRE STEERING WHEEL($5620), CARBON FIBRE ENGINE COVER VENTS($7470). 10 SPOKE ALLOY STAGGERED WHEELS! 235/35/ZR19 FRONT WHEELS AND 305/30/ZR20 REARS WRAPPED IN PIRELI P-ZERO TIRES! TIRES MEASURED AT 10/32S IN THE FRONT AND 6/32S IN THE REAR. YELLOW MCLAREN BADGED FRONT AND REAR BRAKE CALIPERS WITH DRILLED ROTORS. BRAKE PADS AND ROTORS IN GOOD CONDITION. OVERALL THIS MCLAREN IS CLEAN INSIDE AND OUT. FRESH PA INSPECTION AND EMISSIONS GOOD THROUGH 5/19. THE CARFAX IS CLEAN SHOWING 3 OWNERS NO ACCIDENTS AND 4 SERVICE RECORDS. TO VIEW THE FREE CARFAX MOST PICTURES OR VIDEO GO TO WWW.LWAUTOMOTIVE.COM. WE SHIP WORLDWIDE, FOR A QUOTE OR ANY QUESTIONS CALL OR TEXT 724-799-9563. THANKS FOR LOOKING THIS MCLAREN IS SHOWN BY APPOINTMENT ONLY! Message: Thought you might be interested in this 2014 McLaren MP4-12c.